Click here to view a video from Peggy! 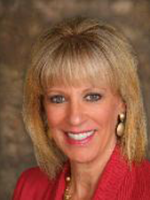 Peggy Holdren is the founder of Holdren & Associates, Inc. She became licensed as a real estate salesperson in 1987, and became a real estate broker in 2000. She married her husband, Jim, in 1980 and they have 3 beautiful children, Jason, Steven and Lauren. Peggy specializes in residential real estate, new construction,relocation, multi-family, acreage, subdivisions, light commercial,bankruptcy/repos, and short sales. Her professional achievements include being an Eagle Award Winner for six years consecutively, earning Lifetime memberships in the Diamond, Ruby and Emerald categories with the Illinois Association of REALTORS®, being in the top 1% of Top Producers since 1989, consistently being a Multi Million Dollar Producer, earning the Hall of Fame Lifetime award and voted Who's Who Realtor of the year for 2005. I want to earn your business and having said that I plan to give personalized service to Buyer and Sellers. By using the internet, local multiple listing service, virtual tours and effective referral networks to find and sell property. Your online, in-touch, out-front, 24 hour a day real estate consultant for all your real estate needs in the Champaign County and surrounding counties. I'd be happy to show you how I utilize the latest technologies, market research and business strategies to meet your expectations. Real Estate is one of the most exciting investments you can make and by listening to your needs I will find solutions that are tailored to you so your experience will be most rewarding. With almost 80 percent of home buyers today going online to search for properties it is important to understand the needs of such pro-active consumers. By having command of the internet and being a member of the local multiple listing service I can go virtually anywhere within the system to help you locate, buy and sell property. If you think you might be going into distress or falling behind with your mortgage payments – call me. I will help you sort out the complicated options that you will be facing in order to help you move through your situation with the best available outcome. I will work hard with you and your bank in order to try and salvage your credit rating.